Note: The following giveaway post is brought to you by Free Birds movie. I received the same giveaway prize pack but all thoughts are my own. The holidays are FAST approaching (do you feel it, too?!). One of our favorite holiday traditions is heading to the theater the day after Thanksgiving to see a family movie (usually something animated) and this year, there’s a hilarious, family-friendly film coming out just in time to keep that tradition going strong. I am excited, not only because the story sounds like so much fun, but because the voice cast is incredible! In this hilarious, adventurous buddy comedy for audiences of all ages, directed by Jimmy Hayward (Horton Hears a Who! ), two turkeys from opposite sides of the tracks must put aside their differences and team up to travel back in time to change the course of history – and get turkey off the Thanksgiving menu for good. Free Birds opens November 1 in theaters all over! Starring the voices of Owen Wilson, Woody Harrelson, Amy Poehler, Dan Fogler, Lesley Nicol, George Takei, Colm Meaney, Keith David, Carlos Alazraqui, Dwight Howard <–what an awesome cast! Have you ever heard of Kiwi Crate? We just got our first Kiwi Crate package and fell in love. 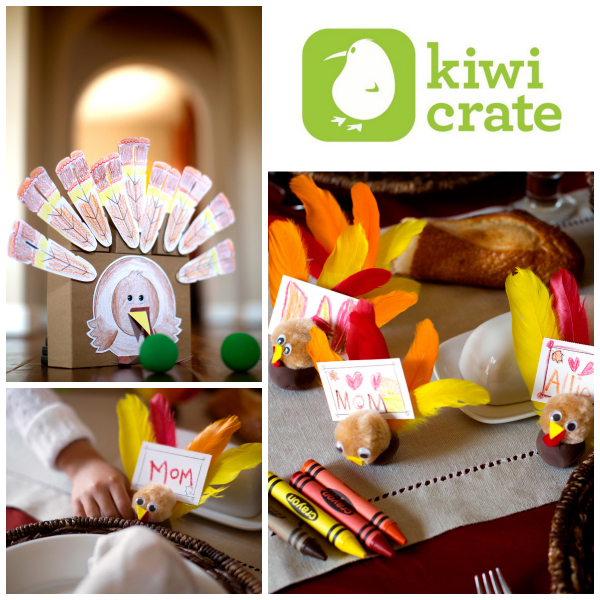 Kiwi Crate delivers creative, hands-on projects for kids ages 3 and up – and they make a perfect gift for the holidays, birthdays, or any special occasions. Recently featured in InStyle, Parenting Magazine, and US Weekly, Kiwi Crate has also been awarded Dr. Toy 100 Best Children’s Products of 2012, Parent’s Choice 2012 Gold Award, and an Oppenheim Gold Seal Best Toy Award. Kiwi Crate has a whole store full of engaging kits for kids. Each kit includes 2 to 3 hands-on crafts or games for kids to complete. Turkey Place Cards: Kids will love decorating and setting the Thanksgiving table with these adorable turkey place card holders. 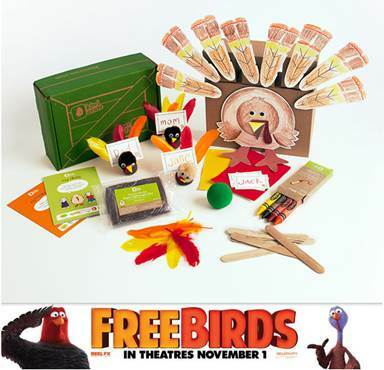 Enter to win a FREE BIRDS prize package! Each prize pack is valued at $44.95. Enter on the Rafflecopter form below. Giveaway will end on 10/24/13 and the winner will be notified via email. Good luck! We always love carving our pumpkins! Baking (anything with pumpkin), evening walks in the park, decorating the house. A lot of things I love about fall! Since turning 21, my dad takes me wine tasting in the Finger Lakes in the Fall :) What a guy! We like to go apple picking, then bake goodies for friends and family with the apples. We like to go to the local pumpkin patch and support the local growers. We try to get the family all together for Thanksgiving and we watch football after a big dinner! Raking leaves, then having a weinie roast. We go to the local Fall Festival and have pumpkin donuts with apple cider! We always try to go to the lake and feed the ducks with our kids and now grandkids. We always play board games when my family comes into town for the Holidays. it has been a tradition for YEARS! We visit the local Wildlife Refuge in the fall to look at the migrating geese, ducks, and other birds! i love baking ginger bread cookies for all the fall holidays! I love to go to a “ghost walking tour” around Halloween time when I can. It’s so much fun to be out in the crisp air getting some exercise and listening to the tour guide tell fascinating stories. Donating food to those in need, and our Fall festival at church! We love to take a drive to Amish country. On the way we get to see the rolling hills and the beautiful colors on the trees and then we eat and shop and people watch. Our favorite Fall family tradition is picking apples. We love to invite the family and cook together on thanksgiving! Decorating for Halloween is a favorite tradition! We have lots of homemade decorations, and we continue to make more! Must make it a point to see this pic. Baking, Apple Picking, Pumpkin Patches, Thanksgiving Are All Fall Favorites! We go to a pumpkin patch with a fun corn maze! We go to a local farm that has a pumpkin patch and farm animals! We have a stuffed toy turkey that we set out on our dining room table as a centerpiece every year. I love decorating the house for Fall with wreaths and Fall knick knacks and candles. I always organize a play date at the pumpkin patch. This year since we have so many fall activities going on I’ve organized my daughter’s birthday there next weekend. We cook and bake together. i don’t make certain dishes during the year so it a real treat for the kids. One of our favorite traditions is making apple pies together every Fall! we love to make rolls and baked goods. We enjoy autumn trips to the farmer’s market where we shop for seasonal produce. At home we cook and enjoy our favorite autumnal fruits and veggies. I love visiting the pumpkin patch every fall with the kids. We go pumpkin and apple picking as a family each year.